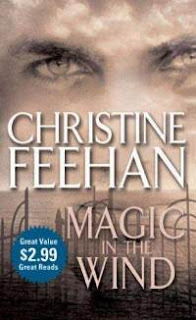 “Magic in the Wind” is on the short story that kicks off Christine Feehan’s Drake Sisters series. The premise of the series is that there are 7 sisters, each with a different magical gift. A prophecy says that one day, the gate to their home will open for the man meant to fall in love with the oldest sister, Sarah. Then, from the oldest, ending with the youngest, each sister would find her true love. Finally, the youngest sister will again begin the prophecy by taking over the family home and having 7 daughters of her own. Damon Wilder moved to Sea Haven to escape some bad guys trying to kill him… just as the mysterious Sarah moves back home. He hears so much town gossip about her that he goes to investigate and (shockingly) the gate opens for him, beginning the prophecy. I like Sarah. She is strong and tough and not the 21 year-old ingenue we see in so many romance novels. She helps Damon fight for survival and finds the love of her life in the process. I would have liked to have the set-up of the series more fleshed out, but it’s a short story and an OK one, so I’ll give it 3 1/2 stars. I have only read the first book, but have already bought the next 2! Excellent!! !